Fashion Designer Roberto Cavalli has dressed some of the world’s most notable names and now he’s adding an even bigger name to the list – Coca-Cola. 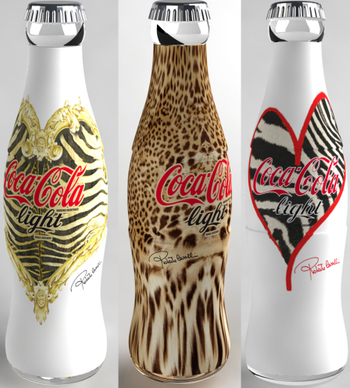 Coca-Cola Light (Europe’s version of Diet Coke) will be getting a fall fashion makeover compliments of Cavalli himself. He’s created a trio of limited-edition designs to adorn the classic glass soda bottles. The three motifs feature the designer’s staple animal prints – zebra and leopard. The limited run of 300,000 bottles will be distributed exclusively in Italy from September through December. For those of you not fortunate enough to be living in, or visiting Italia this fall, fear not, expect a bevy of ebay listings for these covetable creations.